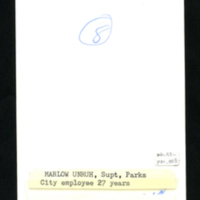 Marlow Unruh, Superintendent of Parks, city employee 27 years -- label on back of photograph. Bandy, Murray C., "Hesston Centennial 1886-1896", pg. 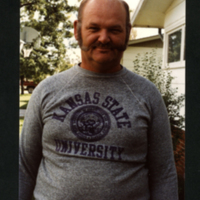 135.
unknown, “Marlow Unruh, Superintendent of Parks,” Hesston Public Library, accessed April 25, 2019, https://hesston.digitalsckls.info/item/1439. 3.5 in x 5.5 in.